Just like a manufacture is always making an effort to improve the product quality, we understand there is always room for improvement in logistics. Our biggest concern is how to create, maintain, and improve the total logistics for our customers, which is starting from manufactures’ door and ending final users’ door. We are facing our own concern together with our customers with years of experience, adequate number of equipment, and enough warehouse space of ours. In order for us to solve issues and improve the total logistics, we have been working with our customers very closely. 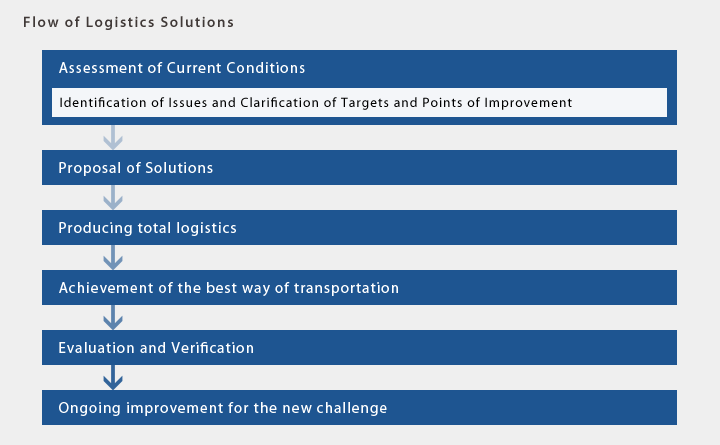 We propose the best fit logistics for each customer by making full use of our own know-how, analyzing their issues and requirements. Our own physical asset including established overseas network is making it easier for us to support customers to solve their logistics issues.